Beekeeping is an effective way for poor people to strengthen their livelihoods and fight poverty. Bees for Development provides information to assist them. We work at the heart of an international network of people and organisations involved with apiculture in developing countries. Our new Beekeeping Information Portal is now open on this site. There are hundreds of new pages and reference materials to download, and we will be adding more over the coming months. Take a look, and let us know what you think: we welcome your recommendations for important texts to add. This extensive task has been made possible with funding support from Anglo American Group Foundation. Click here to take a look. Also new here is the special African Beekeeping Information Portal. This unique facility has been made possible with funding from the Wales for Africa Fund of the Welsh Assembly Government and the Rowse Family Trust. Click for the African Portal. Our aim is to assist people living in poor countries to achieve sustainable livelihoods through beekeeping. Contact members of the global beekeeping community to share knowledge and experiences. 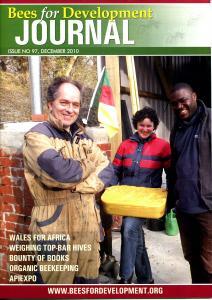 A valuable and regular source of information, up-to-date news and experiences about apiculture worldwide. A gateway to the largest range of beekeeping information relating to developing countries.